Sweet Pickle Designs: Santa, the elves need to work faster! Santa, the elves need to work faster! I love making things for people, love seeing their excitement when they get it, love hearing about how much fun they have making things and memories together! It makes my day! So this "Santa" has been pretty busy out in her little workshop making some fun stuff and apologizes that her camera doesn't get much use to show all the fun things I've been working on! Made up this snowman as a door hanger! He looks so cute on my door I've got to make one for me too! These Noel letters are done in the St. Nicholas font! I love how cute and wavy the letters are! 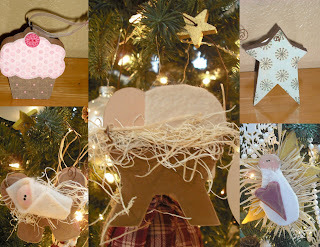 Here's a couple of snap shots of a couple or ornaments I made for the bazaar. pretty as the paper that goes on it! I do love the baby Jesus ornaments! who stopped in front of my house to tell me that she loved my "barn" nativity as I call it. She told me that she had seen it last year and had been waiting for me to put it out this year. My sister Candace and I made these the last two years for our bazaar. This was last year's version that I tweaked a little. I love how it turned out and it is my favorite Christmas decoration to put out! So I'm off to my little shed to start chopping again! Don't forget to send me your cute pictures of your finished projects! My oh so talented Sister-in-law Autumn posted hers on her blog Here! I love to see what you can do! I really love that snowman-he is just too cute! Just came over from crafty sisters-you have a lovely blog! I am excited to have found my way here tonight through the Design Dump. you have so many great ideas! I am happy to become a follower!! Thanks you guys! You gave me goose bumps! Hello - are you still selling the "barn" nativity scene. I love it!